At Toyota of Ardmore, our expert technicians use Genuine Toyota Motor Oil to help keep your vehicle running great and also to help maintain it's value. Genuine Toyota Motor Oil is formulated to defend against corrosion and to maintain proper application of oil on cylinder walls. 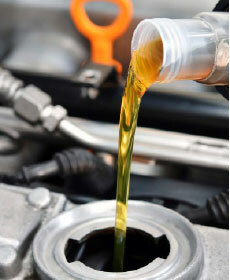 If it's time for your vehicle to have a factory recommended oil change, please give us a call or schedule an appointment online and visit the experts at Toyota of Ardmore today! Contact us at (580) 226-1313. Service includes up to 5 quarts of conventional or synthetic oil, genuine Toyota oil filter, inspect and adjust all fluid levels, tire rotation + complimentary multi-point inspection. Plus environmental fees and tax. Please present coupon at time of write up. Not valid with any other coupon, offer or advertised special. Limit 1 coupon per person. Toyota of Ardmore. Toyota, Lexus & Scion only.